File renamer not dependent on the Finder. Is there a better alternative to Skooby Renamer? Is Skooby Renamer really the best app in File Management category? Will Skooby Renamer work good on macOS 10.13.4? Skooby Renamer is a utility for renaming files and folders. 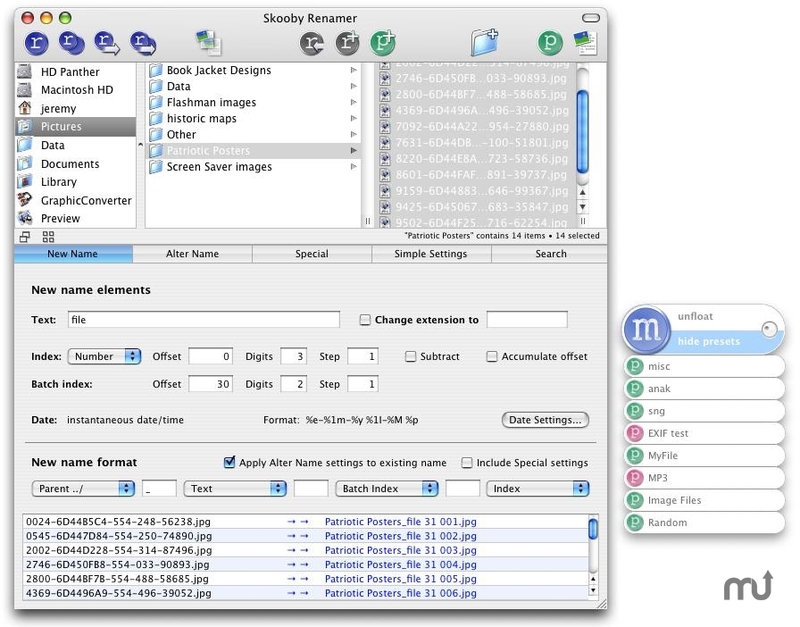 Because it has its own Finder-style file browser, it can be used independently of the Finder. No need to drag files into the application for renaming - they're in there already. Skooby Renamer comes with a mini-app which gives you instant drag-and-drop renaming capability from the Finder or any other file-browsing application. Finder-style column browser with sidebar for easy file selection. Thumbnail viewer for easier browsing of images. Flexible and powerful New Name options, with name, number and datestamp elements. Improved main thumbnail browser appearance. File browser now copes properly with alphanumeric list-ordering of filenames with more than one number in. Options for altering existing filenames, including find/replace (regex supported), trim, remove specified characters, change case, make Windows and/or UNIX compatible, plus many more. Pixel-size calculation and EXIF extraction for image files. Presets - create and save sets of renaming options which can be retrieved and applied at a stroke. Presets can also be used with the Widget. File preview drawer gives full-size preview of file contents. File system search by filename, type, date, with regex support. Four different types of rename operation - Rename; Copy & Rename; Move & Rename; Copy Rename & Move.